Time is money, right? That's why it's so important to maximize every minute of the day. Yet this is often much easier said than done. In our fast paced world, you have to fit more into your day in order to stay ahead of the game. We are each given the same twenty hours each day, and yet some people seem to be more productive than others. How can this be possible? This article takes a look at some ways to achieve improved productivity that are actually easier than you might have imagined. Keep reading to learn how you can increase production and make the most out of the time you're given. We all tend to try to juggle too much at once. Even though it feels like you're getting more done in any given moment, that's merely an illusion. In fact, you will accomplish less and the quality of your work will ultimately suffer. It's all about focus. The mind cannot focus on more than one task at a time. Attempting to tackle more than one task with actually result in lost time and productivity. This is a bad habit. Instead, make an effort to complete a single task before moving on to the next. Many of us try to keep our heads down and push through the work day without a break. After all, the harder you work the more you'll get done, right? Wrong. The reality is that people who take a break every 90 minutes are more productive than those who don't. This might seem contrary to popular thought, but the brain needs a break. Mental focus is taxing. It's easy to lose track of time when focused on a task. That's why we recommend setting a timer. When the timer chimes at the end of 90 minutes, stand up and move around. Go outside and get some fresh air. Stretch your legs. Drink some water. Eat a healthy snack. 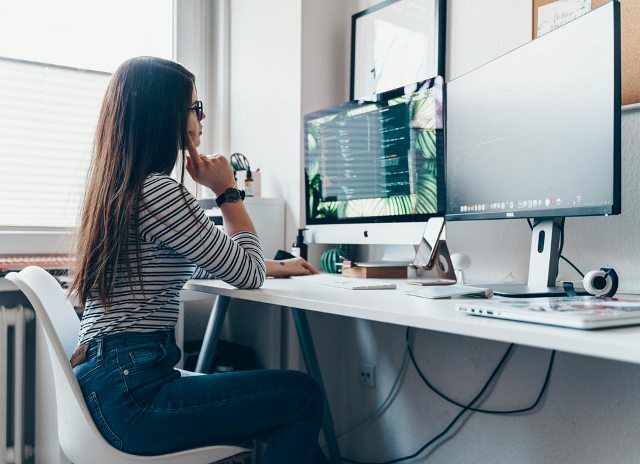 Not only will you find that this increases focus while you work, these consistent breaks also refresh your brain to allow it to function at a higher level and sparks creativity. Have you ever gotten your best ideas while driving the car or washing the dishes? Sometimes doing a mindless task relaxes the mind so that it can operate more efficiently. Interruptions are the enemy of productivity. When you are in the zone and the phone rings, your mind is suddenly yanked out of the flow of the flow state. Even a short interruption can be costly. In the movie Phantom Thread, the main character, a famous fashion designer, is briefly interrupted by his assistant who has brought him tea. The interruption makes him and angry, and he scolds her. She apologizes, telling him she's leaving with the tea, to which he coldly responds, "The tea is leaving, but the interruption is staying right here with me." Focus is a fragile thing. Even the smallest interruption can impact hours of work. And it doesn't have to be an external source that distracts us from the work. When it comes to interruptions, we are often our own worst enemy. When it's time to focus, get in the habit of turning off your ringer. Learn to ignore emails, phone calls, and texts. Designate specific times of the day to deal with those things. Smartphones are addictive, and learning to break free of their constant presence can be incredibly liberating. Turn off your music. Stay off the Internet. And set boundaries with those in the office around you that you are unavailable during those times. Perhaps you've heard it said that "Perfection is the enemy of good". This was a quote from the philosopher Voltaire, who also said, "Better a diamond with a flaw than a pebble without." Keep in mind that the desire for perfect will hold you back from getting things done. Give yourself a clear deadline, stay focused, and accomplish the task. To learn how scrum can benefit your team, check out the information on this reliable site. No one likes deadlines, yet they are very useful. The novelist Robert Crais once said in an interview that a deadline never made any book any better, but a deadline has helped get many good books finished. Keep in mind that deadlines are simply boundaries designed to keep you focused so that work gets completed on schedule. Just because you're seated at your desk, or staring at your computer, doesn't mean you're actually accomplishing the task at hand. You might sit for an hour, yet only work for five or ten minutes. Make a conscious effort to track your actual work time. You'll likely be shocked at how much time you're wasting. This is a simple productivity tool you can use to quickly accomplish simple tasks. The two- minute rule simply states that if you have a task that will require less than two minutes to complete, just do it. Don't think about, just get it done and check it off your list. Many people have long commutes to and from the office. This is time often wasted reading the paper or staring at social media. Why not take advantage of this time to get work done? Reply to emails or texts that would distract you at home or work. Or take care of tasks on your mobile device so that they are out of way and cleared from your workload. After all, this probably a better use of downtime than catching up on the latest Facebook posts. You strive to get as much done each week as possible, and the tips for improved productivity contained here can help. Just remember that it's more important to work smart than it is to work hard. Click here to see the top 25 marketing and entrepreneurship books for 2019.